When eating a plant-based diet, it’s important to make sure you are getting plant-based vitamins too! Monitoring your vitamin levels to ensure that you are eating an adequate amount of everything necessary to be your healthiest self is a key aspect of nutrition, and something we should all do. One important vitamin to make sure you’re getting is calcium, to help with strong bones. While many people think of it as only being attainable from dairy, you can get your daily dose of calcium from other sources, like these awesome plant-based calcium supplements! Don’t forget to check out our Product Recommendations Archives! 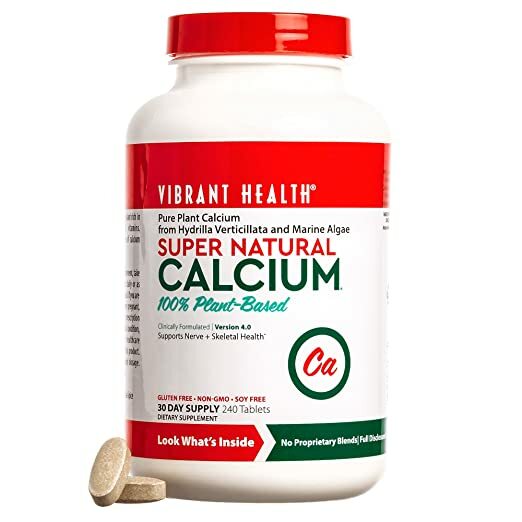 Vibrant Health Super Natural Calcium, a natural vegan supplement, gets its calcium from two plant sources: hydrilla verticillata (a freshwater plant) and lithothamnium (a calcareous algae). The company asserts that natural calcium, the type that is found in these calcium supplements, is more compatible with human digestion and is more easily metabolized. Amazon reviewer James Moss says, “I went to a discount grocery store a bought some calcium (calcium carbonate) because I heard muscle cramps might be caused by low calcium levels and store calcium seemed to make my finger nails stronger but I still had the muscle cramps. I purchased Super Natural Calcium in the hope it would work. Sure enough now the muscle cramps have gone away. Also my toe nails have been brittle but are improving. I have been taking half the recommended dosage but have decided to cut that in half. This is the best calcium supplement I have ever tried the rest just never showed results.” Many reviews say they cut the dosage, since 1 serving is 8 tablets. However, the full serving size has 844 mg of calcium from plants! You can get a container of 240 tablets for $21.60. 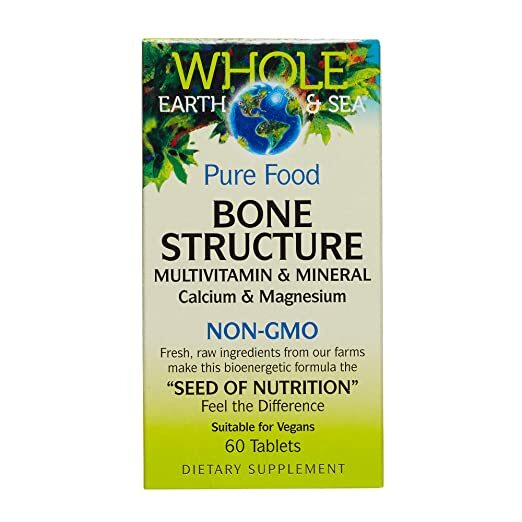 Get your calcium in addition to Vitamin D3 with the Bone Structure Multivitamin & Mineral from Whole Earth & Sea. This supplement offers 200 mg of calcium from algae in each serving and is made with non-GMO, raw whole-food ingredients. It also offers many other vitamins to support healthy bone strength. Amazon reviewer Juanita says, “This is a good product with no added sugar,” and another Amazon customer simply stated, “Love these vitamins!” These vitamins are available in a pack of 60 for $25. The Amazon Elements Calcium Complex supplements gets calcium from algae from Icelandic sea beds. This product contains no artificial colors or flavors, no chemical preservatives, and is vegan and gluten free. Each batch is also tested to ensure quality and safety, and the test results are available to the public on Amazon. If you want a supplement where you can check the quality and be sure of what is in the product you’re buying, then this is may just be the calcium supplement for you. An Amazon review by Jordan discusses just that, saying, “The transparency code is really cool. Normally i’m skeptical about vitamins, but scanning this code showed me the potency and purity of the product. Really cool!” These supplements are available in a pack of 195, a 2 month supply when taken as recommended, for $18, making them cost-effective as well. It can be difficult to find a vegan gummy vitamin, but Liv Kids Super Bones Gummy provides a gummy supplement that even a kid would enjoy! Not only are they vegan, but they’re also non-GMO, kosher, nut, soy, peanut and dairy free, halal certified and gluten free, making them safe for many people with many different dietary restrictions. A serving of two vitamins has 250 mg of calcium, and they taste like lemons, but have no artificial sugars or colors! Reviewer Ada says, “These gummies taste great, My son loves them!” Get your hands on these kid-friendly gummy calcium vitamins in a container of 90 for $15. 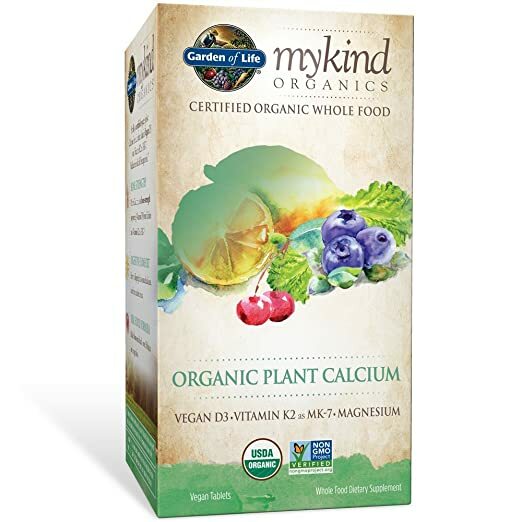 The calcium magnesium formula in Garden of Life’s mykind Organic Plant Calcium also includes vegan vitamin D3 that comes from lichen and vitamin K2 MK7 to help with overall bone health and decrease the risk of osteoporosis. This product is a certified organic whole food, and a serving of 3 tablets has 800 mg of calcium from organic algae. It’s made from real food: This vitamin has over 20 fruits and vegetables! It is certified USDA organic, non-GMO, soy and corn free, gluten free and has no synthetic binders or fillers. One reviewer says, “I have done a lot of research on vitamins and nutritional supplements throughout my life trying to be a wise health consumer. However it is shocking to find how many supplements contain several types of fillers + ‘chemically’ or GM derived ingredients…some being known to be actually dangerously ‘unhealthy’ for long term consumption. Garden of Life is a quality brand containing raw and organically produced plant based natural ingredients without fillers or chemical additives… I feel safe taking these knowing they are sourced organically, non~GM plant based instead of from animal bones or from mineral rock. I don’t eat animal bones or stones/rock so why would I dare to ingest them daily in pill form for calcium?!? No thanks !! I’ll invest in real digestible nutrition from Garden of Life.” You can find them in a pack of 180 for $45. 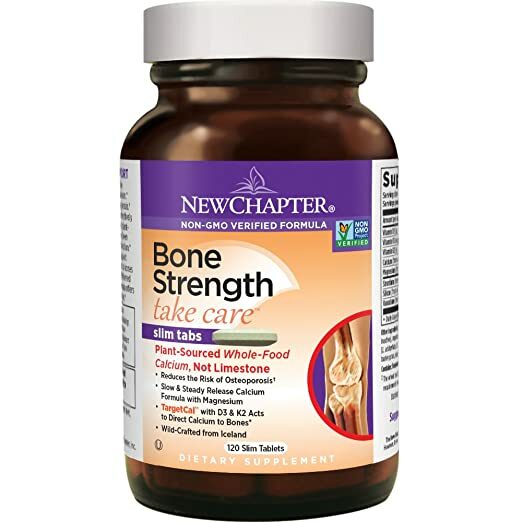 New Chapter Bone Strength calcium supplement offers plant-sourced whole food calcium as well as vitamin K2, D3 and magnesium to help absorb the calcium. It is also advertised to have a 3-in-1 benefit, also helping with joint flexibility and heart health. A serving of 3 tablets offers 770 mg of calcium. These vitamins are non-GMO certified, kosher, gluten free and sustainably sourced with no limestone or chalk, no animal byproducts, no synthetic binders or fillers, and no nuts. D. Stone left an Amazon review, saying, “Two years ago I was diagnosed with osteoporosis. I have been using this for the last two years and my DEXA scan now says I’ve been downgraded to osteopenia! My doctor is astounded by the improvement! he says keep doing what you’re doing and he made a note of what I was taking so he could recommend it to other patients.” You can find this product at a price of $40 for 120 tablets. 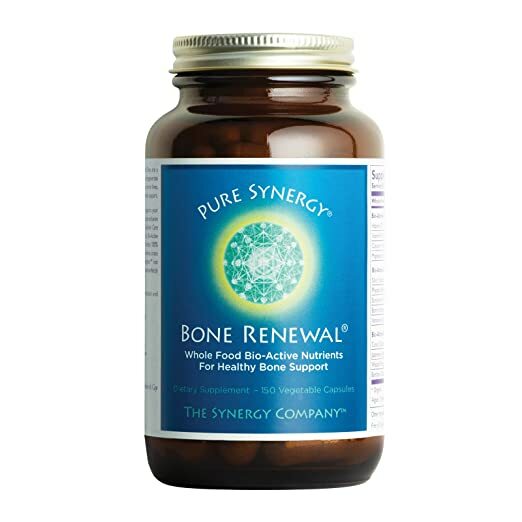 Pure Synergy Bone Renewal is a vitamin that offers plant-based calcium from Icelandic red algae and white sesame seeds. It also offers vitamin D3 and K2, magnesium, as well as herbal extracts including wasabi and saragassum. It’s processed with no chemical solvents or additives, has wild-harvested ingredients, and is non-GMO and gluten free. In the recommended serving of 5 capsules, there is 800 mg of calcium. One reviewer says, “My husband has been taking this for a few years now. He has seen a 4% increase in his bone density scan. Works great!” These vitamins are available for $40 for 150 capsules, a pretty good deal. 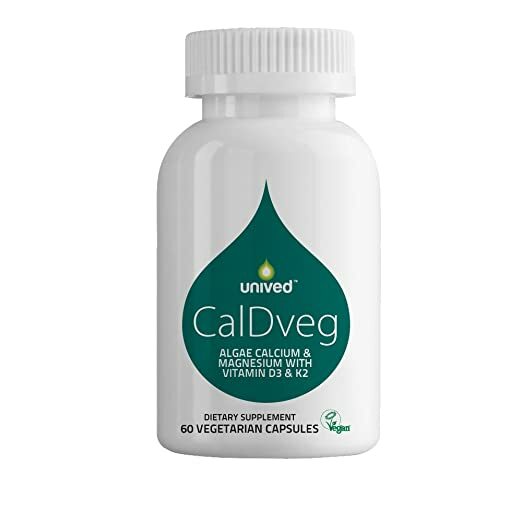 Unived CalDveg offers organic calcium and magnesium in addition to 73 other trace minerals, all sourced from algae. The vitamins have no additive or fillers, and also state that they have no other unnecessary ingredients. They are quality assured, non-GMO, and gluten free! In each serving of 2 capsules, you can get 500 mg of calcium. One amazon reviewer says, “I am so satisfied with this product and as a long time user of multivitamins/supplements and a health coach this one meets my expectations. My nails are harder, my bones feel good and I am running my best mile! I am glad I tried these and just ordered another bottle. I take a two a day and this gives me the energy i need to go all day and sleep like a baby.” Grab a bottle of 60 for $30. 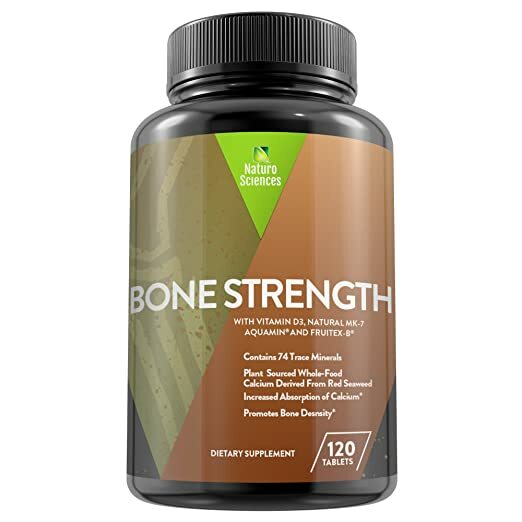 This Naturo Sciences Bone Strength bone and joint-strength calcium supplement includes FruiteX-BⓇ, a fast acting support complex, as well as vitamin D3, magnesium, and 74 trace minerals. This product is made in an FDA certified facility, is made in the United States, and is non-GMO. 3 tablets provide 745 mg of calcium. One amazon reviewer says, “I have been using this product for a couple of weeks and I feel great. I have a lot less aching in my hip and I am looking forward to even better results as I continue to use this. I like that it is taken as 3 easily swallowed pills per day, some products require you to take 6 a day!” Order this supplement in a bottle of 120 for $20, a very affordable price. For more ways to get calcium in your diet, check out 10 Dairy-Free Foods Packed With Calcium and more recipes in our High Calcium archive! We also highly recommend downloading our Food Monster App for even more recipes that will get you your daily dose of calcium, which is available for both Android and iPhone, and can also be found on Instagram and Facebook. The app has more than 10,000 plant-based, allergy-friendly recipes, and subscribers gain access to new recipes every day. Check it out! Informative read! Would like to add our product Tuskca as well to the list..
One should never ever supplement with more than ~360mg of calcium a day, and even then preferably not in one go. A calcium supplement is not like the calcium in food, because it is absorbed very quickly and too much supplementary calcium in a day, especially over 400mg, will cause blood imbalances and harmful calcium deposits.